The fundamental printing technology for either type of thermal printing is the same. Both use heat in the print head to create an image on the material being printed. Thermal transfer printing uses ribbons that transfer pigment onto the material being printed. This is the equivalent of ink. Direct Thermal printing has a pigment system in the paper that can be activated by heat. 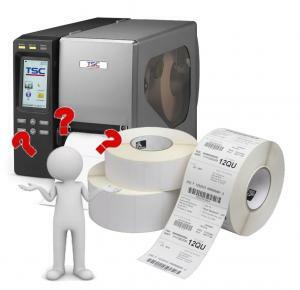 You can read about thermal transfer printing here or read about direct thermal printing here. Let’s figure out how to make the decision. You will need to understand more than one criteria to make you decision. So the first question is how long does my label need to be legible? If you are labelling a short shelf life product, you may only need legibility for up to 6 months. If that is the case you can tick the direct thermal box. Direct thermal technology is not good for long duration labelling as it fades over time. It is difficult to give a hard and fast rule for durability but 6 months is about the maximum. If you need legibility to last for 6 months or several years, you will need to use a thermal transfer system. Legibility may be affected by the environmental conditions the label is subjected to. Factors that will reduce lifespan are u.v. levels (direct sunlight, humidity or moisture. High ambient temperatures allow for chemical reactions that will diminish durability. If the label is subjected to water then direct thermal technology will let you down. 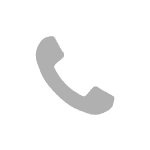 The only time a direct thermal label would be suitable outside is for a very short time such as a day or two. You will also experience problems with adhesives but that is another point dealt with later. As a general rule, if your label is exposed to moisture, condensation or water then you will need to use a plasticised label. Labels made from polypropylene (PP) or polyester (PE) are waterproof but these materials can only reliably be printed on using a resin ribbon. As explained in the thermal transfer article here, resin ribbons give the best performance but are also more expensive. You cannot reliably use wax or even a wax/resin mixed ribbon with PP or PE. Thermal transfer ribbons can give an excellent quality finish. The nature of the printing process and the super-thin ribbons does come with some issues. The ribbon is so thin that it can ripple and crease during the print process. This can lead to creases in the printed output that shows as unmarked areas on the label. High-quality thermal transfer printers will have a range of features such as pressure and tension settings for the labels and the ribbons to minimise this problem. Different manufacturers approach the problem differently too. Direct thermal printing generally gives a good even finish as the thermally activated pigments are printed onto the paper and this gives the material an even coating. As a result, it is rare to have areas that do not perform. One of the downsides is that a faulty batch of direct thermal paper can only be identified if the material is printed on. It is rare but occasionally bad batches are received. For a richer depth of colour, you can turn up the thermal settings of the printer. This is done in the software and will affect both direct thermal and thermal transfer performance. 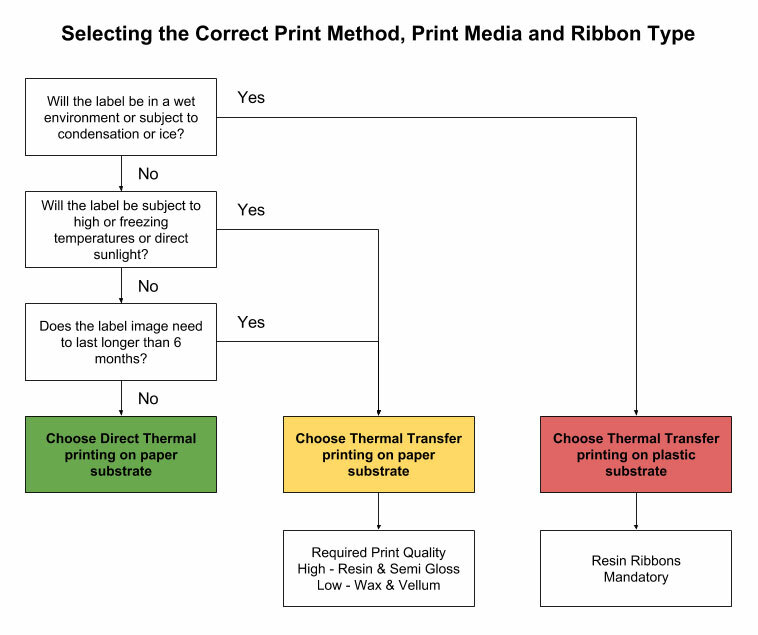 If you need to use a high-resolution printer, we would recommend using a resin ribbon. At the very least, the material cannot be economy types but should be coated, commonly known as semi-gloss. If you want a really high depth of colour, combining direct thermal and thermal transfer works too!